Note: If you add a file to another area of Canvas (e.g. Modules or Assignments) and then rename the file in Course Files, the file rename will not update in any other Canvas location and must be changed manually. 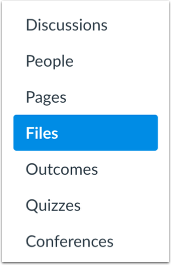 Please ensure that your file names are correct in Course Files before adding them to other content areas. To rename a file, click the line item for the file . Click the Options icon , then click the Rename link . In the text field, change the name of the file . To save the name of the folder, press the Return (Mac) or Enter (PC) key or click the Check button . To return to the previous title, click the Cancel button . Note: Renaming or removing the extension in the file name may strip the extension from the file when it is downloaded. Previous Topic:How do I move and organize my files as an instructor? Next Topic:How do I create a folder in Files as an instructor? Table of Contents > Files > How do I rename a file as an instructor?